In the art world, one thing transcends high prices and elite provenance. It is the most important element that all truly great paintings must possess – wallpower. 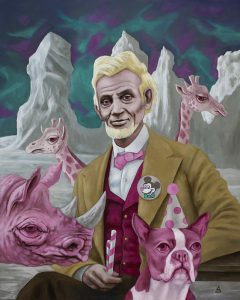 “Peppermints with Lincoln in the Land of Extreme Albinism” by artist Sean Madden. When it comes to artist Sean Madden’s works, there is no doubt they command a presence that begs to be looked at, admired and most importantly, talked about. 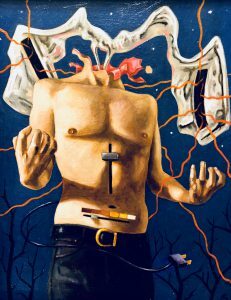 Recently named 2018 “Artist of the Year” by the Limner Gallery in New York, Sean Madden has become a master of Pop Surrealism, rivaling the work of some of the most celebrated artists in the Lowbrow movement today. With its blend of pop culture imagery and the dreamy world of Surrealism, the Lowbrow art movement (also known as Pop Surrealism) began in the 1970s and has become increasingly recognized by the fine art establishment through the success of artists like Mark Ryden, Robert Williams and Josh Agle (known commercially as “Shag”). Originally from Buffalo, Madden spent decades perfecting his artistic abilities, developing his technique by using layers of washes and glazes that bring his paintings to life. His skill has not only brought him followers and fans but it also opened the door for him to create pieces for the Hollywood movies My First Mister and Scream 4. At times provocative, Madden’s work has been exhibited around the globe, fueling dialogue and igniting the imaginations of its viewers. In his role as a public speaker and member of the acid jazz power trio “FlashBamPow,” Madden continues to educate and entertain audiences, while sharing his passion for art. “The Eye Monsters from Planet 17” by artist Sean Madden. 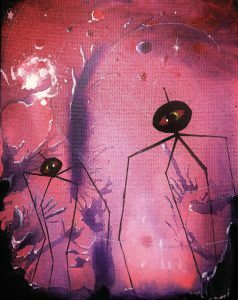 The first of Sean Madden’s paintings to be added to The Michael Aaron Gallagher Collection was the 1993 piece titled, “The Eye Monsters from Planet 17.” A former sci-fi magazine illustrator, Madden’s compelling alien invasion scene is bursting with an energy that jumps from the canvas and is reminiscent of the 1950s sci-fi comics. Two years later, Michael added what is perhaps the most talked about painting in his entire collection, “Peppermints with Lincoln in the Land of Extreme Albinism.” Recently featured on the cover of Slow Art magazine, this extraordinary oil painting is an example of Pop Surrealism at its best, receiving rave reviews when it was on display in Los Angeles, San Diego and Buffalo. “He became a toaster at midnight,” oil painting by artist Sean Madden. From its colorful blend of visually stunning imagery to its complex metaphors and social commentary, Madden’s daring creativity pushes the boundaries of fine art into a new dimension. As Michael’s favorite living artist in the collection, he hopes to someday add another Madden piece to his exhibit and continue to share his extraordinary art with the world. For more information about Sean Madden’s work and to purchase original paintings and prints visit www.seanmaddenart.com.